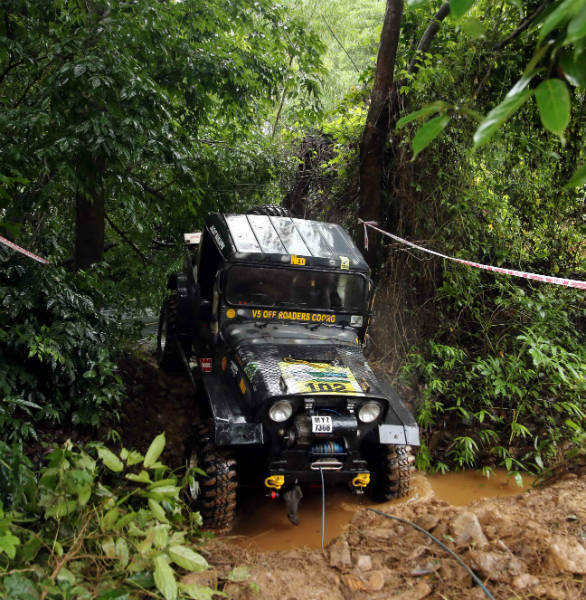 The fifth edition of the Rainforest Challenge India started yesterday, July 23, at a remote location in Goa near Sanguem. The already difficult SS 1 to 5 were made even more tricky with the incessant rainfall but Sanbir Singh Dhaliwal (co-driver Gurpartap Singh Sandhu) from Chandigarh and representing Gerrari Off-roaders emerged at the top of the points table.The fifth edition of the Rainforest Challenge India started off yesterday, July 23, at a remote location in Goa near Sanguem. The already difficult SS 1 to 5 were made even more tricky with the incessant rainfall but Sanbir Singh Dhaliwal (co-driver Gurpartap Singh Sandhu) from Chandigarh and representing Gerrari Off-roaders emerged at the top of the points table. They scored 387 points out of 500. 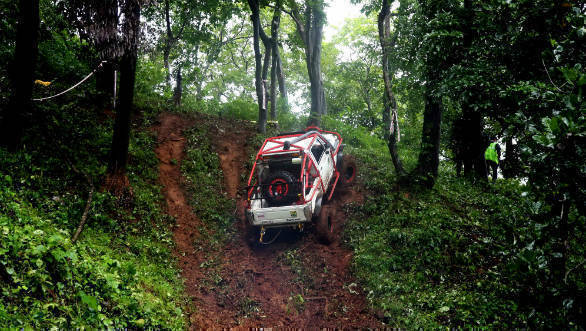 Following them were Jagat Nanjappa (co-driver Chetan Changappa) from Coorg and Arunachal Pradesh's Chow Ujjal Namshum (co-driver Ingpeng Mein) in second and third place with 332 and 300 points respectively. Nanjappa was representing V5 Off-roaders while Namshum was from MOCA. Teams were allocated a maximum of 15 minutes for completing an SS, each one worth 100 points. The competitors who were unable to finish a task within the allowed time were given a DNF (Did Not Finish). Further, teams were penalized for mistakes like breaking a peg or a bunting or for touching a live winch cable. These penalties had a direct impact on the team's cumulative score for that particular special stage. SS1 was the most difficult stage and remained unbeaten through out the day. The series of steep inclines and tricky turns through narrow constrictive pathways meant that competitors were either classified as DNF(Did Not Finish) or DNS (Did Not Start). Ss2 was laid out in a similar format and was also as tricky. SS3 and SS4 tested the competitors in their water wading, speed and control. Speaking of the day's proceedings, David Metcalfe, Chief Scrutineer fy Isuzu RFC India 2018 said that the stages were designed to be tough on the participants and their vehicles. While most of the SS were already quite demanding, the rains today made them considerably tougher. The event moves to Suquerbag in Quepem until July 25 and then to the Green Hills Agri Farm in Maina, Quepem on July 26 and 27, before eventually culminating in Dona Paula. Stay tuned to OVERDRIVE for continuous updates from RFC India 2018.